Create a real cure for the Llodos Plague. Aerona is worried about her uncle, Ornis. He hasn't gotten any better since we returned from the quarantine. In fact, she thinks he's taken a turn for the worse. Aerona is worried about her brother, Dethisam. He hasn't gotten any better since leaving the quarantine. In fact, she thinks he's taken a turn for the worse. Find Kyne's Heart healing herbs, sour milk tea and dragon scale mushrooms. Mix the ingredients in the correct order. Give the potion to Nilyne. Aerona is still worried about her afflicted family member, whose identity depends on whether or not you left Dethisam in the Serk Catacombs. Nilyne, the alchemist, is working on a cure and needs some help. She asks you to gather Kyne's Heart Healing Herbs, Sour Milk Tea and Dragon Scale Mushrooms. According to Nilyne, the innkeeper has the herbs, Grell Flan loved sour milk tea and Sorel Tedas had a taste for exotic mushrooms. The Brooding Elf Inn is across the street from Verobar House, where you came from. Lluther Serethran has the herbs and is happy to provide them for Dethisam. The Flan House is to the west. The tea is on a table in the first room on the left. The Tedas House is to the north. The dragon scale mushrooms are in a potted plant immediately to the right when you enter the house. Return all the ingredients to Nilyne. She has you mix them together at the alchemy table. Nilyne's notes are on a stack of books in front of the table, in case you need help. I should add the Kyne's Heart healing herbs now. I should add the sour milk tea now. I should add the dragon scale mushrooms now. I should take the completed potion and bring it to Nilyne. If successful, you will have created Nilyne's Potion. Give Nilyne the potion, and observe the treatment. She then sends everyone outside so her patient can rest, so you'll need to meet with Aerona outside for your reward. This quest was originally named "Race For the Cure"
There is no quest stage text for the objective, "Mix the Ingredients Together"
Aerona wants me to help the alchemist Nilyne. I should talk to her. There are specific supplies that Nilyne needs to help the afflicted. Kyne's Heart healing herbs, which the innkeeper might have. Sour milk tea, which Grell Flan was fond of drinking. And dragon scale mushrooms, with Sorel Tedas had a taste for. 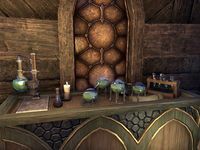 I gathered the ingredients Nilyne asked for, I should return to Ornis' house and deliver these to the alchemist. I mixed the ingredients together. I should bring the concoction to Nilyne. I should wait while Nilyne gives the potion to the afflicted patient. Nilyne wants us to leave the house so her patient can rest and let the potion work its magic. I should head outside and talk to Aerona. Finishes quest I should talk to Aerona and make sure she's handling the situation all right.